Tshepiso Mazibuko is a young photographer based in Johannesburg. Before she was introduced to photography – via an initiative called Of Soul and Joy, which aimed to expose the students of Buhlebuzile Secondary School to the medium – her interest lay in the field of journalism. Although she has switched from words to images as a means of expression, on one hand she remains true to her original ambition in that she tells stories of people who live near her, documenting the township in which she was born and still lives. On the other hand, she veers away from the mode of documentation, playing with light and focus to create evocative images that Sean O’Toole has described as ‘capable of recognising in the bare facts of human circumstance something close to poetry.’ Her sensitive approach to image-making, and her honest representation of real people, makes Mazibuko a successor to the likes of Santu Mofokeng and David Goldblatt. 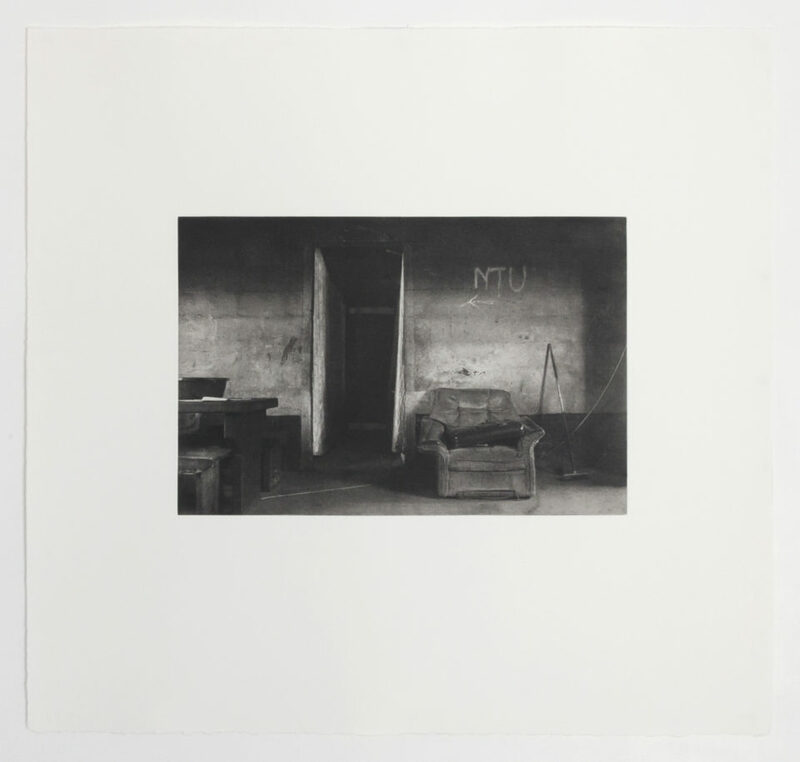 The photogravure was made for Edition S 2016 and comes from a body of work titled Gone and Here that, like most of Mazibuko’s work, was shot in the township of Thokoza on the East Rand. In order for Zhané Warren to produce the photogravure, a transparent positive image containing the photograph was exposed to light-sensitive pigment gelatin tissue. After laminating the gelatin tissue to a rosin-covered copperplate it was etched in a series of acid baths so as to achieve the tonal range and details. The Gone and Here project contains figures, interiors and landscapes, and Mazibuko’s treatment of the different subjects contain marked distinctions. In the images of figures and interiors, Mazibuko’s approach to light and focus is looser, allowing forms to blur and recede into shadow, which creates a sense of movement. 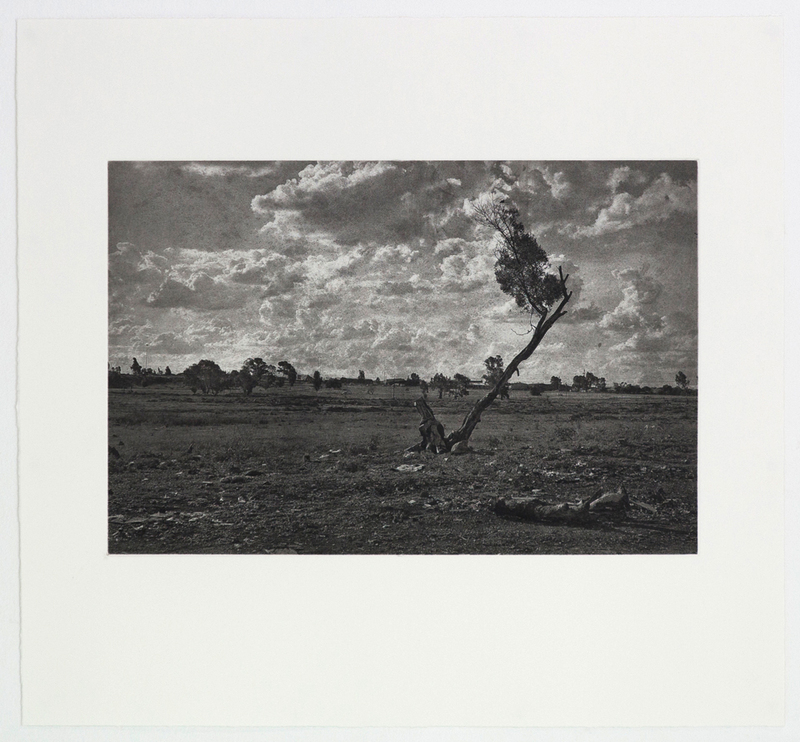 The landscapes – such as seen with her photogravure – are crisp and have a depth of focus that allows for the depiction of very clear and specific detail – cars, power lines and people in the distance, individual rocks and dry blades of grass in the foreground. Mazibuko sets up a dynamic relationship between the people depicted and the environment in which they live. Tshepiso Mazibuko was born in 1995 in the township of Thokoza, Ekurhuleni in South Africa. She recently completed her studies at the Market Photo Workshop, and has participated in numerous exhibitions both locally and internationally. Most recently, these include Free from my Happiness at the Johannesburg Art Gallery, which was accompanied by a photo book of the same name; and 80 Days of Summer: Stories of Identity at the Ghent International Photography Festival in Belgium. She has been selected for inclusion in the Addis Foto Fest 2016, for which she will travel to Ethiopia, and Les Recontres d’Arles photography festival in France in 2017. Her pictures have also been published in a Belgian newspaper, De Standaard.